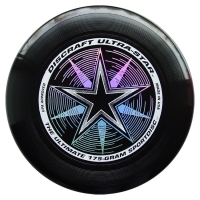 GAIA Europe proudly distributes Discraft Ultra-Star 175g ultimate discs. Official weight and size Ultimate Discs of WFDF and all National Ultimate Federations and Associations. This Product was added to our catalogue on Tuesday, 19. October 2010.